A bass that won’t appeal to the masses - but which deserves to do so. A unique design, plenty of tonal options and sublime playability. The pricetag and design won’t suit everyone. We were very impressed by the Rikkers Treeline bass, although its appearance and price point were both a little challenging. 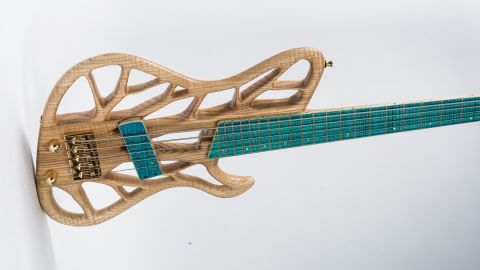 Two years later, Dutch luthier Rikkers has moved the model forward, equipping this year’s Treeline with a dyed turquoise fingerboard and a pickup which features switching technology designed to enhance the available tones and performance. The price certainly reflects the craftsmanship - but at approaching four grand, does it have tones that you couldn’t live without? There’s no escaping the startling visuals of the Treeline range, although if the gaps in the timber were filled in, we’re sure that bassists of traditional taste would be drawn to this singlecut design as well as the avant-garde among us. Fortunately, the nature of this design leads to certain benefits, namely improved balance and a very manageable three-kilo weight. Utilising local German olive ash, the light colouring works well with the timber’s darker grain - but the real eye-catching element is the turquoise dyed olive ash fingerboard. The flame maple figuring of the fingerboard readily stands out, as does the flame figuring in the natural neck timber on the reverse of the neck. And wow, what a neck! Benefiting from an outstandingly comfortable D-shaped profile with a sculpted heel at the neck joint, the playability across the whole neck is superb, while an excellent setup, high-quality fret work with no sharp fret ends anywhere and a professional level of finishing take the package to another level. The 19mm string spacing at the bridge and 47mm nut width mean the strings are spaced very well, giving the player room to navigate the fretboard in comfort. The extensive lower cutaway offers perfect access to the upper frets, while abalone side position markers are matched with pearl markers on the front fingerboard facing. Gold hardware has been used throughout with open-gear Hipshot Ultralite machine heads, an ABM top-loading bridge, gold controls for volume and a stacked bass/treble control. For further tonal flexibility, the Rikkers-produced Switchbucker pickup features two small switches on its housing, allowing the player to select individual coils within the pickup. The Treeline’s light weight and much improved balance are very large positives: this is a great instrument to play. Acoustically, the neck has an inherently woody and organic sound, the tone of which is solid and powerful with plenty of low midrange and natural resonance. Plugging in, we’re presented with a well-rounded but lively tone: a quick check of the pickup settings shows that we’re using a Jazz bass pickup arrangement by default. Although the pickup has been designed to operate as four different units in one housing, switching between the single-coil and humbucking options is relatively simple, and the changes in tone are instantly recognisable. The Treeline’s treble response is immaculate, with a crisp top end that has finesse and character without being too glassy or percussive. In terms of playability, we were hard pressed to find fault with this bass in any respect: it’s easily one of the most enjoyable five-string instruments we’ve had the pleasure of playing. The contemporary design, tonal considerations and implementation and the all-round sonic display are equally pleasing. Fingerstyle tones are solid but refined, while the attack that a pick offers brings another character to the table. Percussive techniques are also well catered for: perhaps the Treeline allows such techniques to project because there’s no excessive timber to dampen the performance? If you have preconceived ideas about this bass, leave them at the door. Like many players, we had our own suspicions: is this a design gimmick, and what does the design actually offer? Well, we can happily report that this is a very fine bass. Its performance far exceeded our expectations: we could happily have carried on playing this bass for days, weeks, even months. Personally, we can live with the visuals because the tones are exceptional. Whether we’d be prepared to part with close to £4,000 for it, we’re not so sure - but don’t close your mind to the possibilities which the Treeline offers: it really is something special.